Background We investigated a subject with an isolated cytochrome c oxidase (COX) deficiency presenting with an unusual phenotype characterised by neuropathy, exercise intolerance, obesity, and short stature. Methods and results Blue-native polyacrylamide gel electrophoresis (BN-PAGE) analysis showed an almost complete lack of COX assembly in subject fibroblasts, consistent with the very low enzymatic activity, and pulse-labelling mitochondrial translation experiments showed a specific decrease in synthesis of the COX1 subunit, the core catalytic subunit that nucleates assembly of the holoenzyme. Whole exome sequencing identified compound heterozygous mutations (c.199dupC, c.215A>G) in COA3, a small inner membrane COX assembly factor, resulting in a pronounced decrease in the steady-state levels of COA3 protein. Retroviral expression of a wild-type COA3 cDNA completely rescued the COX assembly and mitochondrial translation defects, confirming the pathogenicity of the mutations, and resulted in increased steady-state levels of COX1 in control cells, demonstrating a role for COA3 in the stabilisation of this subunit. COA3 exists in an early COX assembly complex that contains COX1 and other COX assembly factors including COX14 (C12orf62), another single pass transmembrane protein that also plays a role in coupling COX1 synthesis with holoenzyme assembly. Immunoblot analysis showed that COX14 was undetectable in COA3 subject fibroblasts, and that COA3 was undetectable in fibroblasts from a COX14 subject, demonstrating the interdependence of these two COX assembly factors. Conclusions The mild clinical course in this patient contrasts with nearly all other cases of severe COX assembly defects that are usually fatal early in life, and underscores the marked tissue-specific involvement in mitochondrial diseases. Complex IV or cytochrome c oxidase (COX) is the terminal enzyme in the respiratory chain (RC), responsible for catalysing the oxidation of cytochrome c by molecular oxygen. It is composed of 13 subunits, of which three are encoded in mitochondrial DNA (mtDNA) and form the catalytic core of the enzyme. Mutations causing an isolated COX deficiency have been reported in all three mtDNA genes,1–3 whereas mutations in structural nDNA genes are rare and have been reported in only three genes, COX4I2, COX6B1, and COX7B.4–6 In addition to the structural subunits, the holoenzyme contains several prosthetic groups, including four redox-active components, comprising two copper centres and two heme a moieties, and three redox-inactive metal ions (zinc, sodium and magnesium ions) of unknown function. In yeast, more than 20 biogenesis factors have been shown to be involved in the assembly of COX, many of which have human homologs. Mutations have been reported in patients with isolated COX deficiency in 14 nuclear DNA (nDNA) genes that are required for the early assembly of COX (SURF1, C2orf64/COA5 and FAM36A/COX20, COA6/C1orf31),7–10 transcription and translation of COX subunits (LRPPRC, TACO1, and COX14/C12orf62),11–13 catabolism of sulfide (ETHE1),14 biosynthesis of heme a (COX10 and COX15),15 ,16 and biogenesis of the CuA site of COX2 (SCO1 and SCO2).17 ,18 In addition, mutations have been found in PET10019 that may play a role in the intermediate stage of COX assembly, and in FASTKD220 whose role in COX function is currently unknown. In this study, we investigated a subject with an isolated COX defect who presented with an unusual phenotype characterised by neuropathy, exercise intolerance, obesity and short stature. Informed consent for the study was obtained from the subject and her parents. She was the first child born to healthy non-consanguineous parents. Pregnancy and birth were unremarkable. Retardation of motor development was noticed from an early age, and the subject did not achieve independent walking until the age of 3 years. She had exercise intolerance since early childhood. At her current age of 34 years she has short stature (138 cm), she is obese with a weight of 85 kg, and she has cognitive impairment. Her face is slightly dysmorphic with epicanthic folds and deep-set eyes. She has a sensorimotor polyneuropathy of demyelinating type with severe axonal loss, which is most pronounced in the lower extremities with absent tendon reflexes and pes cavus. Muscle strength is only mildly affected. She can only walk short distances using a cane, and is wheelchair dependent on longer distances. The major reason for her walking disability relates to the severe sensory disturbances in her lower extremities. A muscle biopsy, at age 30 years, showed a complete absence of COX staining (figure 1A). The plasma lactate was marginally elevated to 3.0 mmol/L (reference <2.1 mmol/L). Muscle histology, and protein and sequence analysis in the subject with COA3 mutations. (A) Complete absence of muscle fibres staining positive for cytochrome c oxidase (COX) is seen in the COA3 subject (left), whereas normal COX staining is shown in a healthy control for comparison (right). (B) Blue-native polyacrylamide gel electrophoresis (BN-PAGE) analysis of fibroblast protein shows absence of fully assembled COX in the COA3 subject. Each of the five OXPHOS complexes (I–V) was visualised with a subunit-specific antibody that recognizes the native complex as follows: CoI (NDUFA9), CoII (SDHA), CoIII (UQCRC1), COX (COX4), CoV (ATP5A1). Complex II is the loading control. (C) DNA sequence analysis of COA3 indicates the position of the heterozygous c.199dupC mutation in the subject (top left) compared to the control (bottom left). (D) DNA sequence analysis of COA3 indicates the position of the heterozygous missense mutation (c.215A>G) (top right) compared to the control (bottom right). (E) The alignment of the amino acid sequences of COA3 in different species shows that the mutated tyrosine (black rectangle) is evolutionarily conserved. (F) Immunoblot analysis of fibroblast protein with antibodies against COA3, the structural COX protein COX1, porin and TOM20 shows a decreased amount of COA3 protein in the subject compared to control. The 70 kDa subunit of complex II (SDHA) was used as a loading control. Spectrophotometric analysis of RC enzyme activity24 showed an isolated COX deficiency in muscle (17% of lowest control) and fibroblasts (65% of lowest control). In agreement with the results of RC enzyme activity, blue-native polyacrylamide gel electrophoresis (BN-PAGE) analysis25 revealed a pronounced reduction in the amount of fully assembled COX in fibroblasts, with no visible subassemblies (figure 1B). The levels of the other complexes were normal. Mutation screening of SURF1, COX1, COX2, COX3, mitochondrial tRNA genes, and mtDNA deletion analysis showed no abnormalities. Due to the subject's severe neuropathy, several genes associated with Charcot-Marie-Tooth disease (PMP22, BCSL2, Cx32, MFN2, MPZ, SIMPLE and EGR2) had been screened for mutations when she was in her 20s, but no mutations were found. To search for the disease-causing gene, whole exome sequencing was performed using a total of 3 μg DNA from the patient. The exonic regions were captured with the Nimblegen SeqCap EZ exomeV.2 (44 Mb target region), and sequencing was performed on an Illumina Genome Analyzer IIx as paired end sequencing, 2×76 bases. Approximately 106 million 75 bp paired-end reads were obtained. Mapping of the obtained reads against hg19 was performed using CLC Genomics workbench, resulting in an average coverage of 99×. Variants were called if they appeared where there was at least 10× coverage. The data were filtered using Ingenuity Variant Analysis with the following parameters: a frequency <1% in 1000 Genomes Project data and potentially damaging variants (including non-synonymous substitutions caused by missense and nonsense single nucleotide polymorphisms (SNPs), splice-site SNPs and frameshift changes due to insertions and/or deletions (indels)); furthermore, autosomal recessive inheritance caused by homozygous or compound heterozygous mutation(s) was assumed. Finally, we used the Mitocarta database to search for proteins with strong support of a mitochondrial localisation.26 This resulted in the identification of 33 variants in 27 genes. Two of the predicted pathogenic variants were found in COA3, a known COX assembly gene.27–29 Sanger sequencing of COA3 (RefSeq accession number NM_001040431.2) in the subject and her parents confirmed that she was compound heterozygous for two mutations, c.199dupC (figure 1C), inherited from her father, and c.215A>G, inherited from her mother (figure 1D). The c.199dupC mutation was predicted to cause a frameshift and a premature stop codon, p.Leu67Profs*21. The c.215A>G mutation (rs139877390) has been reported as a rare variant with an allele frequency of 3 out of 8600 in a European-American population in ESP6500 (http://evs.gs.washington.edu/EVS/). It results in the change of a highly conserved tyrosine to a cysteine, p.Tyr72Cys (figure 1E). COA3 is a small two-exon gene where c.199dupC is located in the first exon 14 bp from the exon–intron junction and, thus, is not expected to activate the nonsense mediated mRNA decay pathway. The c.215A>G mutation changes the first nucleotide of exon 2 and could theoretically affect correct mRNA splicing. Analysis of cDNA30 showed expression of both COA3 alleles and no evidence that splicing was affected (results not shown). Immunoblot analysis with a polyclonal antibody against COA3 (a kind gift from P Rehling, University of Gottigen) performed on mitochondrial extracts from fibroblasts showed a decreased steady-state level (by about half as would be expected if the nonsense allele were not expressed) and altered electrophoretic mobility of COA3 protein in the subject compared to controls (figure 1F). The electrophoretic mobility shift could be the result of misfolding, preventing complete denaturation of the protein coded by the missense allele under the conditions used in the immunoblot analysis. In addition, the steady state level of COX1 was severely decreased. To confirm the pathogenicity of the COA3 mutations, a retroviral vector was used to express wild-type COA3 cDNA in patient fibroblasts that had been immortalised as previously described.31 Wild-type human COA3 cDNA was amplified from RNA obtained from control fibroblasts and cloned into a Gateway-modified retroviral expression vector pBabe using LR Clonase II Enzyme Mix (Invitrogen/Thermo Fischer Scientific, Waltham, Massachusetts, USA) and transiently transfected into the Phoenix Amphotrophic packaging cell line using the HEPES-buffered saline (HBS)-Ca3(PO4)2 method as previously described. Virus-containing medium was collected, supplemented with 4 μg/mL polybrene, and used to infect immortalised fibroblast cell lines. 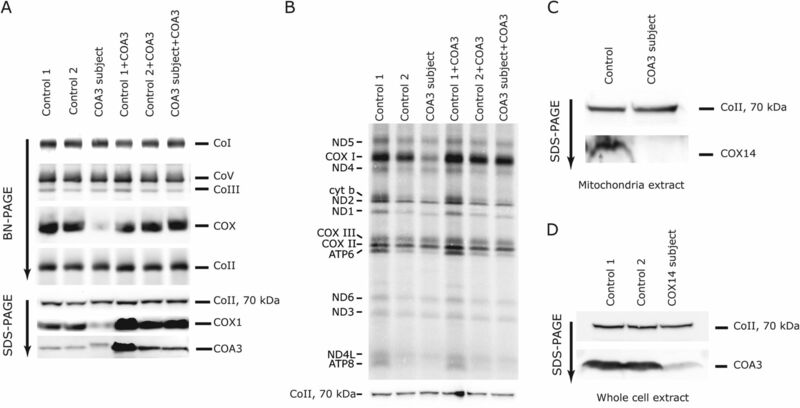 BN-PAGE of fibroblast protein showed that expression of wild-type COA3 did not affect the assembly of complexes in controls, but it rescued the COX assembly defect in subject fibroblasts (figure 2A). The steady-state levels of COX1 and COA3 were similar to that of controls in patient fibroblasts expressing COA3, as revealed by immunoblot analysis. Mitochondrial translation was investigated by pulse-labelling with a mixture of [35S] methionine/cysteine, as previously described.32 A specific decrease in the synthesis of COX1 was seen in subject fibroblasts, whereas the levels of the other mtDNA-encoded proteins were similar to those of controls (figure 2B). Overexpression of COA3 resulted in a rescue of the defect in COX1 translation. 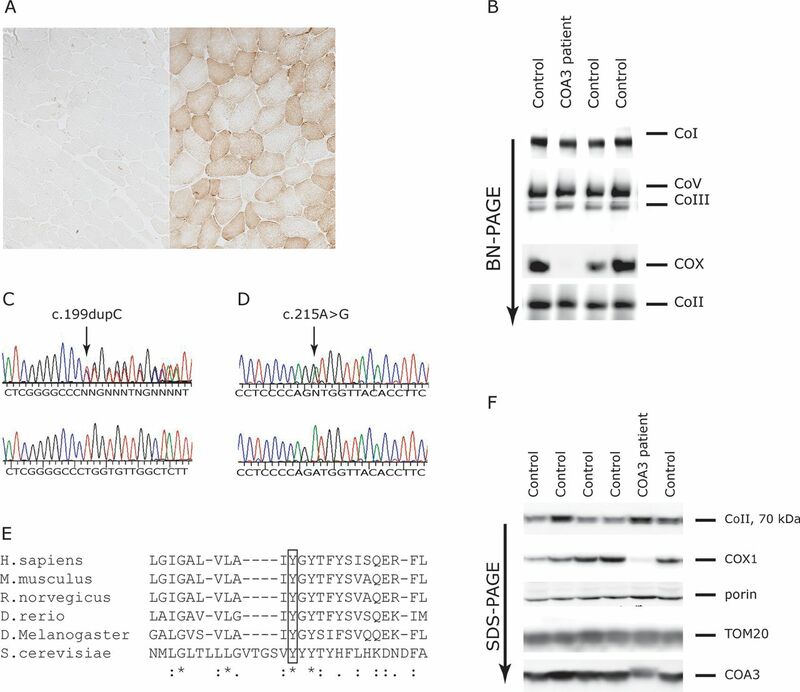 Rescue of cytochrome c oxidase (COX) assembly and COX1 translation defect in subject fibroblasts, and steady state protein levels in subjects with COA3 and COX14 deficiency. (A) Fibroblasts from controls and from the subject with COA3 mutations were transduced with a retroviral vector expressing wild-type COA3. Mitoplasts from untransduced controls and the COA3 subject, and control and COA3 fibroblasts overexpressing COA3 were prepared and analyzed by blue-native polyacrylamide gel electrophoresis (BN–PAGE) (top) (20 μg/lane), and complexes I–V were detected by immunoblot analysis, and by SDS-PAGE (bottom), and immunoblotted with antibodies specific to COA3 and COX1. The 70 kDa subunit of complex II (SDHA) was used as a loading control. In the untransduced subject fibroblasts, a severely decreased amount of fully assembled COX is seen, and the deficiency is rescued by transduction with wild-type COA3. (B) Analysis of mitochondrial translation products in control and subject fibroblasts transduced with retroviral vectors expressing COA3 showing a decrease in the synthesis of COX1 in subject fibroblasts, which is rescued by expression of wild-type COA3 from a retroviral vector. (C) SDS-PAGE analysis showing a severely decreased amount of COX14 protein in the subject with COA3 mutations. (D) SDS-PAGE analysis showing a severely decreased amount of COA3 protein in a subject with COX14 mutations. Another recently reported cause of COX deficiency is mutations in COX14 (C12orf62).13 Immunoblot analysis of subject fibroblasts showed that the COA3-deficient subject had no visible COX14 protein (figure 2C), whereas analysis of fibroblasts from a subject with mutations in COX1413 showed a severely decreased amount of COA3 protein (figure 2D). To our knowledge, this is the first time that COA3 has been implicated in human disease. The COA3 mutations were identified by whole exome sequencing, and consisted of a 1 bp duplication and a missense mutation affecting a highly conserved amino acid. The most severe symptoms were exercise intolerance and peripheral neuropathy, of which the latter is a relatively rare finding in patients with COX deficiency, except in patients with SURF1 mutations.33 The mild clinical course of the disorder, which contrasts with nearly all other cases of severe COX assembly defects, is unusual, and therefore the patient was not diagnosed with an RC disorder until she was 30 years old. She did not have signs of involvement of organ systems such as heart, liver or brain, apart from mild cognitive impairment. The COX defect in muscle was severe with only 17% of control enzyme activity and a very low amount of fully assembled COX. The most likely explanation for the mild disease course is that the COX defect is tissue-specific and mainly affects muscle, although we did not have the opportunity to study tissues other than muscle and fibroblasts. The subunits and cofactors of COX are assembled in a specific order, and the current model proposes at least three subassemblies. The first (S1) contains exclusively COX1, and the addition of COX4 and COX5A leads to the formation of the second subassembly (S2). Finally, the incorporation of the remaining subunits leads to holocomplex formation. The role of COA3 and its homologues in COX assembly has been investigated in human cells, Drosophila, and yeast. Human COA3 is a small protein of 11.7 kDa that localises exclusively to the mitochondrial inner membrane with the C terminus exposed to the intermembrane space.27 ,28 COA3 is not processed after mitochondrial import, suggesting that it is not directed into the mitochondria through a cleavable presequence.28 The p.Tyr72Cys substitution identified in the patient reported here is located in the transmembrane domain. We thank the family for their participation. This work was supported by a grant from The Danish Council for Independent Research Medical Sciences to E Ostergaard (12-127702) and a grant from the Canadian Institutes for Health Research (MT-15460) to EAS.
. Mutations of the SCO1 gene in mitochondrial cytochrome c oxidase deficiency with neonatal-onset hepatic failure and encephalopathy. Am J Hum Genet 2000;67:1104–9. EO and WW are contributed equally. Contributors EO analysed exome data and drafted the manuscript. WW performed the functional studies. KR and MD performed the molecular analyses. LJ performed the exome sequencing. FW performed the enzyme analyses. APB and JV coordinated sample collection and collected the clinical data. EO, JV and EAS designed and supervised the study and participated in the draft of the manuscript. All authors read and approved the final manuscript. Contributors All authors meet all four criteria for authorship.